At Ariel’s Grotto in Disneyland. The logical next fairy-tale for me to talk about is Hans Christian Anderson’s The Little Mermaid, since it’s my favorite. Although my first memories of it are theatrical in nature, it was years before the Disney film existed. I believe the first one I saw was Shelly Duvall’s Faerie Tale Theatre version, and this remains one of my favorites. There was also a version I saw by Toei Animation that was pretty good, and, sometime later, the Shirley Temple version. I can’t say when I first read it, but my mother owned some large books that were collections of fairy tales, fables, and other stories, and I remember starting to go through them at a very young age. These were not kid-sized versions, but books meant for adults and intended to be accurate translations of the original works. For those who are unaware, this is the basics of the original story: the little mermaid (she does not have a name) is fascinated by the world above and in great anticipation of the day when she will finally be allowed to go above the water, as her older sisters can. The day arrives, she sees the prince’s ship, sees the prince, the ship is wrecked, and she rescues him. She leaves him on an island (he does not see her), where he is found and nursed by a girl. The mermaid goes home and asks her grandmother some pointed questions about humans. It turns out that mermaids live for ~300 years, while humans live shorter lives. However, humans have a soul and go to heaven when they die, whereas mermaids simply turn into sea foam. The only way a mermaid can get a soul is to marry a human male. Determined to get a soul (and find the prince), she goes to the sea witch, who is KIND and tries very hard to talk her OUT of it. Undeterred, the little mermaid insists, trades in her voice, becomes human, and is discovered by the prince. She becomes his faithful companion and is given the honor of getting to sleep outside his door (I guess that was something *good* back then). While he is reluctant to get married at first, when he see his betrothed bride-to-be is the girl he thinks saved him, he is overjoyed and the little mermaid is devastated. Not only has she lost her love, but, as part of the spell, she will die the morning after he marries another. The sisters of the little mermaid beg the sea witch for more help, and obtain a magical dagger for the little mermaid. If she kills the prince with it, she will turn back into a mermaid and live a full life. But she can’t do it, because she knows him well by then and loves him, and she jumps into the sea. Instead of just turning into sea foam forever, her love for the prince allows her to become a ‘daughter of the air,’ which will allow her to earn an immortal soul eventually. Despite all its differences, I loved the Disney version. As a fan of happy endings, it didn’t bother me that they changed that (and I never liked the bit about mermaids not having souls to begin with). I was sad that they made the witch evil, but they needed a villain from somewhere, I guess. I also loved the music, which helped a lot. 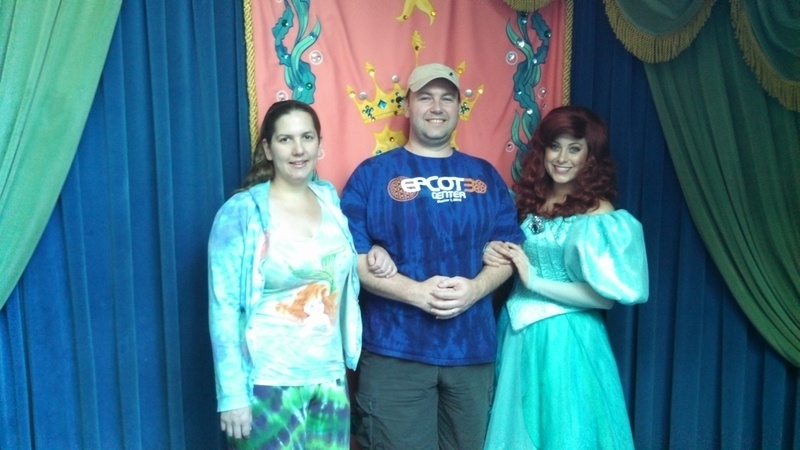 At work we often are asked who our favorite character is and my answer is always Ariel. In ‘researching’ a mermaid-based story I’m writing, I acquired many other theatrical versions of the story. The ones that were made before the Disney version tend to stick much closer to the original story, whereas the newer ones prefer to have a happier ending (and one even throws in a subplot about trash in the ocean). While I like different aspects of each one, Shelly Duvall’s is still my favorite of the non-Disney choices. I’ve thought a lot about why the little mermaid always resonated so strongly with me (and millions of other people). In some ways she is an explorer, the only one of her species that wonders about other creatures, and wants to see outside her world. The Disney version takes this a step further, and has her determined to not listen to the prejudices she was taught, nor fear others. She believes there is more to humans than what the mermaids can see. In addition, she exemplifies the concept of ‘true love’ when she decides to die instead of killing the prince. In the original version she never claimed to love the prince in the beginning; it was the eternal soul that she was after. It was only after the significant amount of time that she spent with the prince that she fell in love with him. I’m not really a fan of ‘love at first sight.’ That seems more like ‘lust at first sight,’ than love, to me. So the fact that she loved him for an actual reason made her feelings much more real to me than those of most other fairy-tale heroines. And sacrificing yourself for another is the ultimate expression of that love. Although Frozen may have replaced The Little Mermaid as my favorite Disney movie, the original story is still my favorite fairy tale, and Ariel is still my favorite Disney character.